Book now the best shore excursions in Geiranger. High quality and safety at the lowest prices. If your are looking for Shore Excursion Geiranger, book now the best guided tours at lowest price with Ancora Tours. Since 2003 we offer you official guides in english, transportation and travel insurance, all included. The highest quality at the lowest rates. The Geiranger fjord is undoubtedly one of the most supreme natural beauties of the world. In fact, this fjord is a UNESCO World Heritage Site. 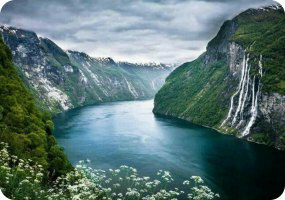 The fjord reaches 1,000 metres in sections, and it’s grand height leaves a lasting impression on all those who visit. Join our shore excursion in Geiranger and experience it for yourself! What’s eating: Salmon in every possible way. Try the famous Gravlaks; prepared with salt, sugar and dill and usually served as appetiser. Souvenir: Snow and Rain Wear, especially for children. The Norwegians are outside all year long regardless of the weather. Dress Code: Comfortable boots or walking shoes. A raincoat or umbrella, waterproofs. Generally warm clothes, with a hat and gloves, sunglasses. The Geiranger shore excursion begins at the Flydalsjuvet viewing platform. From here, the majestic view of the leafy green valley below will take your breath away. It’s a great spot to take some photos, so remember to bring your camera! Next, we’ll head to Dalsnibba Mountain which rises 1,500 metres above the fjord to enjoy more of the areas spectacular scenery. The Geiranger shore excursion also includes a visit to Flydal Gorge, one of the most photographed sights in Norway. From the bottom of the 80ft gorge, we can admire the view of Geirangerfjord behind us. To reach the final stop, we’ll drive on the Ørnevegen, the Eagle’s Way. This section of road twists and turns up the mountainside in 11 hairpin bends. We then arrive at the Seven Sisters Waterfall. The story goes that the seven streams are all unmarried sisters who dance playfully with ‘The Suitor’, the waterfall across the fjord who flirts from afar.